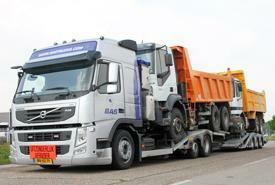 We know the importance of having your truck or trailer in use as soon as possible. Therefore transport is an important part of our full service concept. We offer you transport throughout Europe. Because of our own transportfleet and our wide network with international transport companies, we can transport your vehicle throughout Europa at competitive rates. * All prices are indicative and dependent on the vehicle type and the size of the vehicle(s). If you can't find the harbor you are looking for, or if you want more information, please contact us via our contact form. We can also arrange the shipment of your vehicle, read more about our shipping services. For transporting your truck or trailer we make use of our own transport fleet as much as possible. In our flexible planning we can directly schedule the transport of your truck or trailer and we make sure it fits into the delivery process. Since we have our independant transport planning, and since we have the possibilty to combine cargoes we can offer our customers a fast transport service at the best price. When you let us take care of the transportation of your vehicle we guarantee a fast delivery. You don't have to worry about the delivery of your truck or trailer and you can just sit back until we deliver the vehicle at the required address. 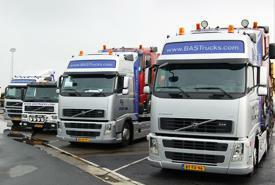 In the mean time, we will keep you up-to-date about the status of the transport via our customer portal "My BAS Trucks"
Read more about "My BAS Trucks"